When it comes time to replace your roof a lot of roofing contractors in Rochester NY will suggest a re roof application or that they are “re roof specialists”. A re roof is when an additional layer of asphalt roofing shingles are applied over the original roof without performing a roof tear off. Although a reroof in Rochester NY will achieve a lower price point for the consumer it will not leave your home protected against the worst of winter weather. Harsh Monroe County winters can cause ice damming and require additional waterproofing that a re roof simply doesn’t provide. Roofing companies in Monroe County like to perform reroofs because they are less labor intensive, there is no roofing debris removal or dumping cost and roofing jobs can be completed faster without having to provide any real long term roofing warranty. Just because a re roof benefits your local roofer does not mean it will benefit you in the middle of a Rochester NY winter storm. A complete roofing tearoff is your best option. Then your certified roofing specialist can determine whether or not you need to replace roof decking, roof flashings and make sure there is adequate roofing ventilation at the roof peak and in the soffits. A waterproofing ice and water shield can then be applied directly to the roof deck. A reputable roofing company will install a minimum of 2 courses of ice and water shield to help delay the damage caused by heavy snow and ice build up and ice damming. Please keep in mind that whether you choose a roofing tear off or re roof that your new roofing is designed to shed water- No residential roofing system or waterproofing underlayment for pitched roofing is made to withstand the damage caused by the “pooling water” behind an ice dam. Remember I said the proper waterproofing underlayments will only help delay damage.It is necessary to keep the snow and ice removed from your roof no matter what the age or type of roof you have. Any roofer who tries to convince you otherwise either doesn’t know any better or doesn’t have your best interest in mind. The pros at Ron Ferris and Son have been protecting homeowners in the Greater Rochester Area for over 35 Years! We won’t sell you roofing products that you don’t need and refuse to install a roof that won’t leave you protected. While we will install an additional layer of roofing over an original roof we caution our clients to evaluate the complete cost and overall situation and let us inspect to make sure the roof ‘s decking, flashing and roof ventilation are all in compliance with building and shingle warranty standards; before moving ahead with a re roof. Cheaper is never better if you have to sacrifice the level of protection provided. Remember your roofing system is your first and only line of defense against the worst Mother Nature has to offer. In evaluating the cost of any new roof in Wayne County NY, the roof installation, maintenance, life expectancy and roof repair cost must all be considered. Independent studies have shown that a new metal roof is the most economical choice when all of these factors are considered. This applies to both new construction roofing and re roofing. Yes, the initial cost of installing a metal roof can be greater than that of an asphalt roof but so are the advantages of a properly installed metal roof. Not only does a new metal roof in Wayne County NY provide outstanding strength and durability; but is also fire resistant, more energy efficient and may save you money annually on energy bills and possibly home owner’s insurance. 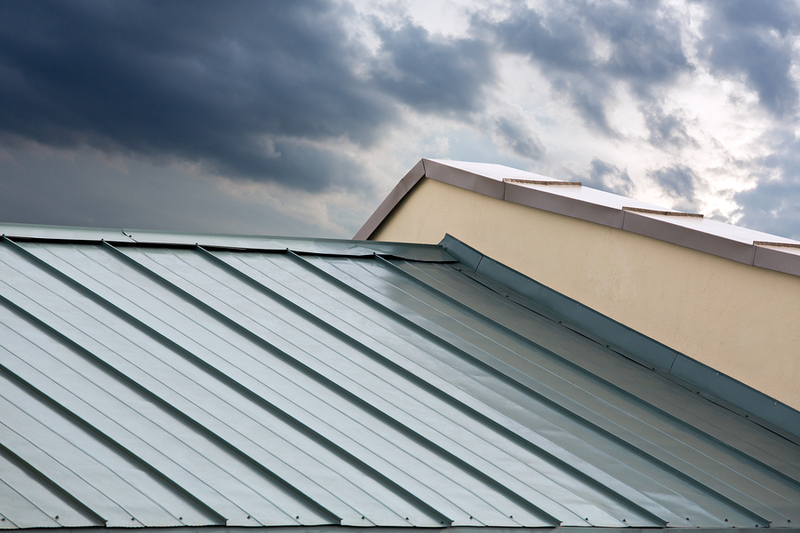 These are all factors that should be taken into consideration when evaluating metal roofing systems. Dutch or Standing Seam: offers a continuous standing seam panel with an integral seam. Continuous panels eliminate cross seams and integral lock and seam technology prevents blow offs. Several styles of ribbing and strait ions are available to further enhance the look of your new metal roofing panels. Advanta Shingle: is manufactured to the look so a dimensional asphalt roofing shingle. Typical application for Advanta Shingles are roofs on either commercial or residential buildings but they are also suitable for walls and mansards. Permashake: panels simulate the look of cedar shake roofing without the maintenance problems associated with such a roof. Metal shake panels of fire resistance and will not crack, warp, split or rot like cedar shake shingles. Standing Seam Shingles: are elegant in their style and feature a four way interlock to ensure water tightness. The panels are installed with concealed metal roofing fasteners and this metal roof allows for snow and ice to easily slide off, preventing damage from freeze and thaw cycles. Castle Top: is a diamond shaped flat metal roofing shingle that provides a unique roof appearance. Different colors may be combined to create interesting patterns and in most cases can be applied directly over your existing roof eliminating the need for a roofing tear off in Wayne County NY. Stone Coated Steel Roofing is also available from steel shingle manufacturer Allmet and are designed to be the perfect roofing solution and the last roof your home will ever need. Stone coated steel roofing stands up to extreme weather, winds and fire; all without sacrificing the look of an dimensional asphalt roofing shingle. With steel as the foundation of your new roof panels, you get the benefits of safety and durability with a roofing product that weighs as little as 1.5 pounds per square foot installed and requires no structural reinforcement. Whether you choose the benefits of a metal roof or stone coated steel for your new roof, make sure you choose a metal roofing company in Wayne County NY that has a strong reputation in the community for quality roofing installations. One who attends training seminars to expand their knowledge and experience with metal roofing installation for residential and commercial applications. A roofing contractor who has taken plant tours and has a thorough knowledge of the metal roofing solutions he presents his clients with. The pros at Ron Ferris and Son have been serving your neighbors in Wayne County NY since 1979 and work directly with our metal roofing manufacturers on a continuous basis to ensure we are providing our customers with the highest quality metal roofing panels and installing them in compliance with warranty and building standards. To learn more about metal roofing or stone coated steel roofing in Wayne County NY call us today at 315-524-8924 or check out our metal roofing services @ www.ronferrisandsonroofing.com.